The market, not long-ago set standards, should dictate parking price and quantity. In another study in 2008, the average time it took to find a curb space in a 15 block area of the Upper West Side of Manhattan was 3.1 minutes and the average cruising distance was 0.37 miles. For each individual driver, 3.1 minutes is not a long time, and 0.37 miles is not a long distance, but because there are so many drivers, the cumulative consequences are staggering. In a year, cruising for underpriced parking on these 15 blocks alone creates about 366,000 excess vehicle miles of travel (equal to 14 trips around the earth) and 325 tons of CO2. Free curb parking in a congested city gives a small, temporary benefit to a few drivers who happen to be lucky on a particular day, but it imposes large social costs on everyone else every day. To manage curb parking and avoid the problems caused by cruising, some cities have begun to adjust their curb parking prices by location and time of day. These cities do not have a complicated pricing model, and they do not aim to raise a certain amount of revenue. Instead, they have established a target occupancy: they aim to produce about an 85 percent occupancy rate for curb parking, which on a typical block with eight curb spaces corresponds to one open spot. The price is too high if many spaces are vacant and too low if no spaces are vacant. But if one or two spaces are vacant on a block and drivers can reliably find open curb spaces at their destinations, the price is just right. We can call this the Goldilocks principle of parking prices. Some cities refer to the policy of setting prices to produce one or two open curb spaces on every block as performance pricing. It can improve performance in three ways. First, curb parking will perform more efficiently. If all but one or two curb spaces are occupied on every block, parking will be well used but also readily available. Second, the transportation system will perform more efficiently because cruising for curb parking will not congest traffic, waste fuel, pollute the air, and waste drivers’ time. Third, the local economy will perform more efficiently. In business districts, drivers will park, buy something, and leave promptly, allowing other customers to use the spaces. San Francisco has embarked on an ambitious program, called SFpark, to get the prices of curb parking right. The city has installed meters that charge variable prices and sensors that report the occupancy of each space in real time. The city will thus have information on curb occupancy rates and the ability to adjust prices in response to the occupancy rates. The city intends to adjust prices once a month, never by more than 50¢ an hour. By nudging prices up or down in a trial-and-error process, the city will seek a structure of prices that vary by time and location throughout the city, yielding one or two open spaces on every block. SFpark embodies two important ideas. The first is that you cannot set the right price for curb parking without observing the occupancy. The goal is to set the price that will yield one or two open spaces on every block; this is the lowest price the city can charge without creating a parking shortage. The second is that small changes in parking prices and location choices can lead to big improvements in transportation efficiency. Figure 1 shows that nudging up the price on crowded Block A by enough to shift only one car to less crowded Block B can significantly improve the performance of the transportation system. This shift will eliminate cruising on Block A and take advantage of the empty spaces on Block B. Even if all the curb spaces are occupied on all the nearby blocks, shifting only one car per block from a curb space to nearby off-street parking can also eliminate cruising. 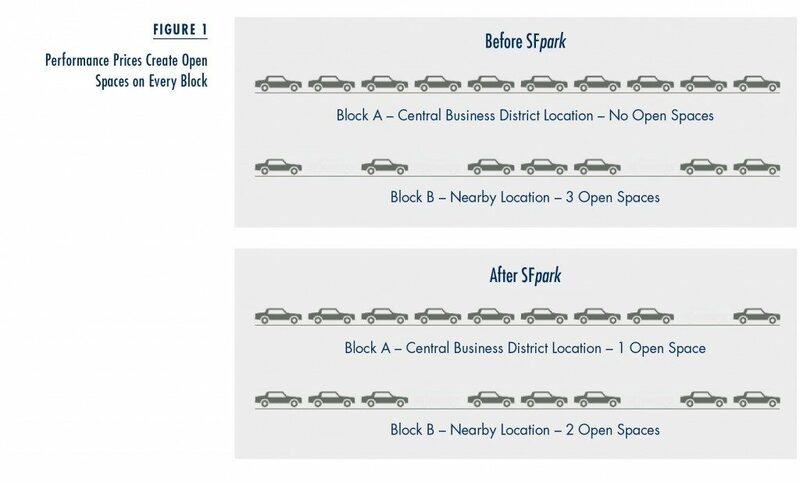 Beyond managing the curb parking supply, SFpark can help depoliticize parking by stating a clear principle for setting the prices for curb spaces: the demand for parking will set the prices. After shifting from a revenue goal to an outcome goal for the parking system and choosing the occupancy rate for the desired outcome, the city council will no longer have to vote on parking prices. If too many curb spaces are vacant, the price will go down, and if no curb spaces are vacant, the price will go up. Wanting more revenue will no longer justify raising prices. Relying on the power of an impersonal market test to set prices makes an end run around the politics of parking. 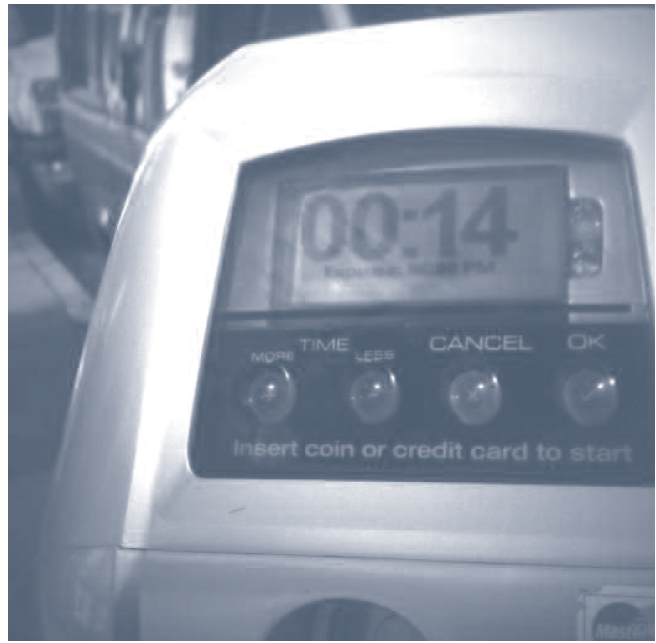 Proposals to increase parking prices or run the meters later in the evening usually provoke vehement complaints like, “If this city operates the parking meters in the evening, I will never drive downtown to eat in a restaurant again.” This threat to boycott downtown restaurants would be a convincing argument if many curb spaces remained empty after the meters began operating in the evening. But this threat ignores the key argument for performance prices: If the meters are priced right, cars will fill most of the curb spaces, leaving only one or two vacant spaces on each block. If most curb spaces are filled, parking meters can’t be chasing all the customers away. If most curb spaces are filled, parking meters can’t be chasing all the customers away. Meters will chase away some drivers, but the curb spaces these drivers would have occupied will become available to customers who are willing to pay for parking if they can easily find a convenient curb space. Because the curb spaces will remain almost fully occupied, merchants shouldn’t worry that performance prices will harm their businesses. And who is likely to leave a bigger tip for the waiters in a restaurant? Drivers who are willing to pay for convenient curb parking if they can always find an open curb space? Or drivers who will come only if they can park free after circling the block a few times to find free parking? Both common sense and empirical research suggest that performance-priced curb parking will motivate more people to carpool, because carpoolers can share the cost of parking while a solo driver pays the full cost. Drivers who pay to park may arrive with two, three, or four customers in a car. Further, performance prices will promote faster turnover because drivers will pay for as long as they park. If a curb space turns over twice during the evening, each space can deliver two groups of diners to a restaurant. For both reasons—higher-occupancy vehicles and faster turnover—performance prices for curb parking will attract more customers to a business district. With more customers, restaurants can expand and hire more waiters and pay more in sales taxes. 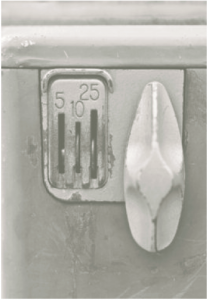 Charging performance prices to manage curb parking can thus benefit many people. A further advantage of performance prices is that they will decline when demand declines during a recession. The price of curb parking will automatically fall to keep the customers coming. The cheaper curb parking will help businesses survive and prevent job losses. But if curb parking prices remain high during a recession, curb spaces will be under-occupied, stores will lose customers, and more people will lose jobs. If cities eliminate cruising by charging performance prices for curb parking, where will the cruising cars go? Because drivers will no longer have to arrive at their destinations 5 to 10 minutes early to search for a curb space, their vehicle trips will be 5 to 10 minutes shorter. The reduction in traffic will come not from fewer vehicle trips but from shorter vehicle trips. Everybody wants something for nothing, but we shouldn’t promote free parking as a principle for transportation pricing and public finance. Using performance prices to manage curb parking can produce a host of benefits for businesses, neighborhoods, cities, transportation, and the environment. Parking wants to be paid for. Reforms involve not only adopting good policies but also repealing bad policies. Requiring all buildings to provide ample parking is one such bad policy that cities should repeal. Some cities have begun to remove minimum parking requirements, at least in their downtowns, for two reasons. First, parking requirements prevent infill redevelopment on small lots where fitting both a new building and the required parking is difficult and expensive. Second, parking requirements prevent new uses for many older buildings that lack the parking spaces required for the new uses. A search of newspaper articles found 129 reports of cities that have removed off-street parking requirements in their downtowns since 2005. 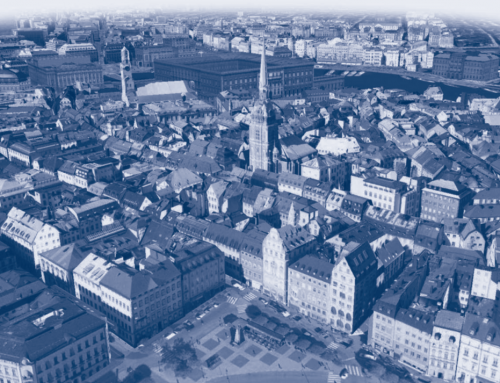 Although newspaper articles don’t represent what all cities are doing, they do include many comments on why cities are changing their policies. At least in downtown business districts, some elected officials think that parking requirements put the brakes on what they want to happen and accelerate what they want to prevent. Some of the reasons given for removing parking requirements are “to promote the creation of downtown apartments” (Greenfield, Massachusetts), “to see more affordable housing” (Miami), “to meet the needs of smaller businesses” (Muskegon, Michigan), “to give business owners more flexibility while creating a vibrant downtown” (Sandpoint, Idaho), and “to prevent ugly, auto-oriented townhouses” (Seattle). Parking requirements force-feed the city with parking spaces, and removing a parking requirement simply stops this force-feeding. Removing a parking requirement is not the same, however, as restricting parking or putting the city on a parking diet. Rather, parking requirements force-feed the city with parking spaces, and removing a parking requirement simply stops this force-feeding. Ceasing to require off-street parking gives businesses the freedom to provide as much or as little parking as they like. Cities can remove minimum requirements without imposing maximum limits, and opposition to maximum parking limits should not be confused with support for minimum parking requirements. Many older downtowns have some wonderful buildings in terrible condition. Minimum parking requirements make restoring these historic buildings difficult or impossible, because they rarely have all the parking spaces cities require for new uses. Spring Street in Los Angeles, once known as the Wall Street of the West, is a prime example. It has the nation’s largest collection of intact office buildings built between 1900 and 1930. Starting in the 1960s, the city’s urban renewal program moved most office uses a few blocks west to Bunker Hill and left many splendid Art Deco and Beaux Arts buildings on Spring Street vacant except for retail uses on the ground floor. In 1999, Los Angeles adopted its Adaptive Reuse Ordinance (ARO) that allows the conversion of economically distressed or historically significant office buildings into new residential units—with no new parking spaces. 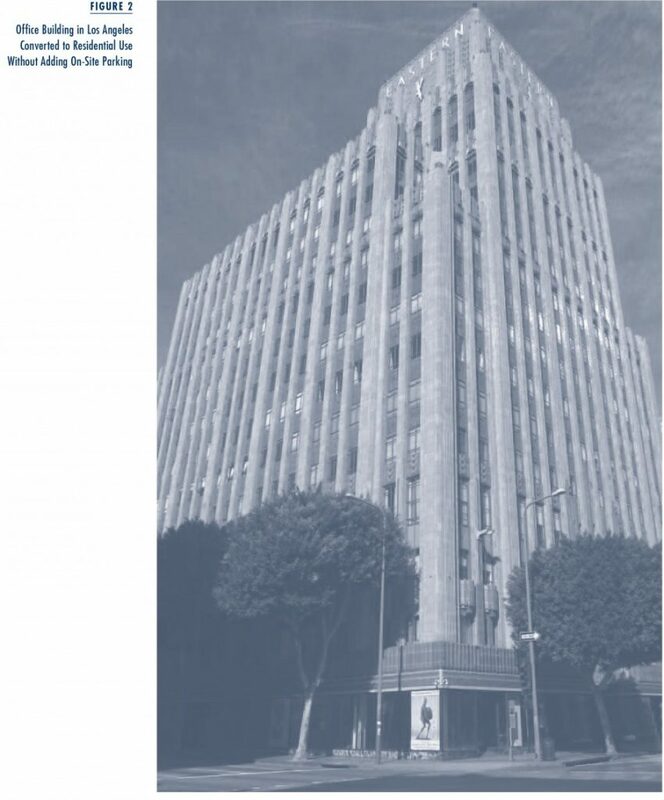 Before 1999, the city required at least two parking spaces per condominium unit in downtown Los Angeles. Michael Manville studied the results of the ARO and found that many good things can happen when a city removes its parking requirements. The ARO also produced other benefits. It allowed the preservation of many historic buildings that had been vacant for years and might have been demolished if minimum parking requirements had remained in place. 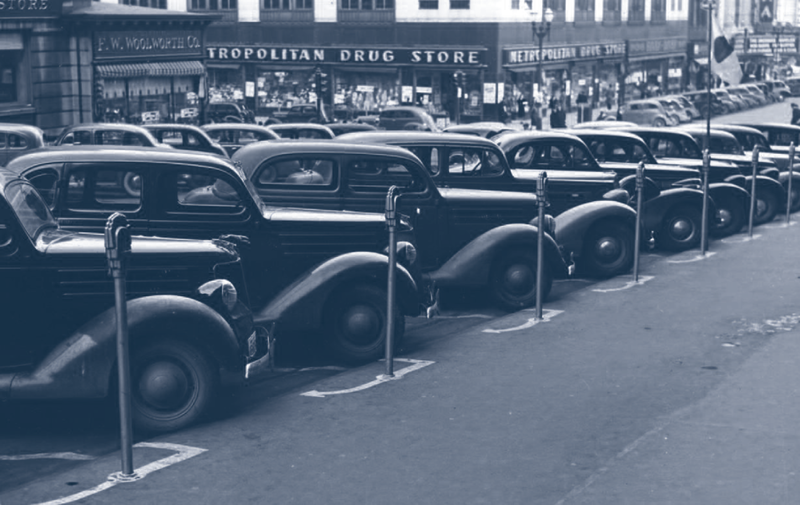 Historic buildings are a scarce resource in any city, and the evidence shows that parking requirements stood in the way of preserving these buildings. The ARO applied only to downtown when it was adopted in 1999, but the benefits were so quickly apparent that it was extended citywide in 2003. We usually can’t see things that don’t happen or count things that don’t occur, but the beautifully restored buildings on Spring Street give us some idea of what parking requirements often prevent. Requiring Peter to pay for Paul’s parking, and Paul to pay for Peter’s parking, is a bad idea. People should pay for their own parking, just as they pay for their own cars and gasoline and tires. Parking requirements hide the cost of parking, but they cannot make it go away, and free parking often means fully subsidized parking. At the very least, parking requirements should carry strong warning labels about all the dangerous side effects. Cities may slowly shift from minimum parking requirements to performance parking prices without explicitly acknowledging that planning for parking had ever gone wrong. 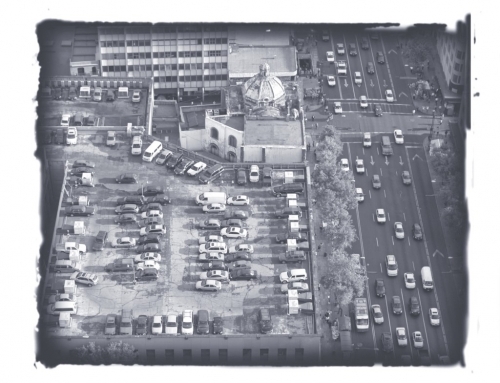 Despite institutional inertia in the practice of planning for parking, reforms are sprouting. 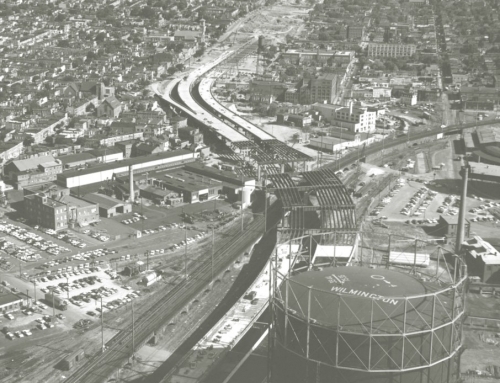 Paradigm shifts in urban planning are often barely noticeable while they are happening, and afterward it is often hard to tell anything has changed. But shifts happen. Planners simply begin to understand cities in a new way and can scarcely remember a time when they understood cities differently. The incremental reforms now under way suggest that off-street parking requirements will not quickly disappear but will gradually erode. Cities may slowly shift from minimum parking requirements to performance parking prices without explicitly acknowledging that planning for parking had ever gone wrong. Eventually, however, planners may realize that minimum parking requirements were a poisoned chalice, providing ample free parking while hiding the many costs. They may then marvel at how their predecessors could have been so wrong for so long. Michael Manville. 2010. 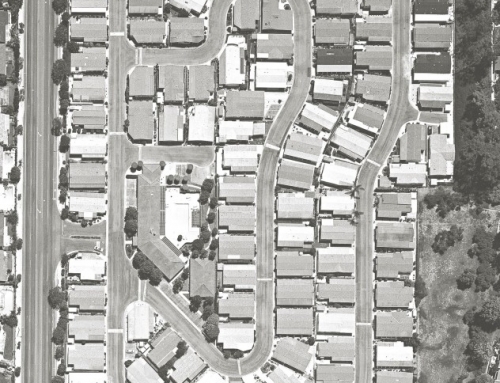 “Parking Requirements as a Barrier to Housing Development: Regulation and Reform in Los Angeles,” UCLA Lewis Center Working Paper, University of California, Los Angeles. Bruce Schaller. 2006. “Curbing Cars: Shopping, Parking and Pedestrian Space in SoHo,” New York: Transportation Alternatives. Donald Shoup. 2011. The High Cost of Free Parking, revised edition, Chicago: Planners Press. Transportation Alternatives. 2007. “No Vacancy: Park Slope’s Parking Problem and How to Fix It,” New York: Transportation Alternatives. Transportation Alternatives. 2008. 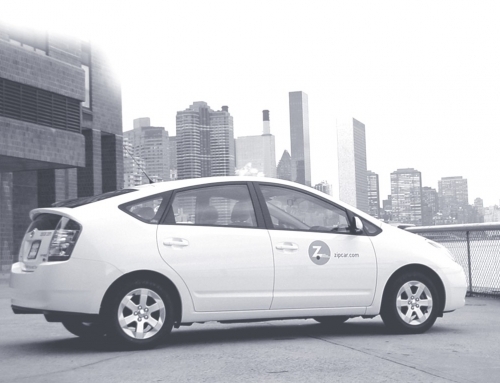 “Driven to Excess: What Under-Priced Curbside Parking Costs the Upper West Side,” New York: Transportation Alternatives.